The club have parted company with Kevin Grosskreutz after an altercation that left him needing hospital treatment. 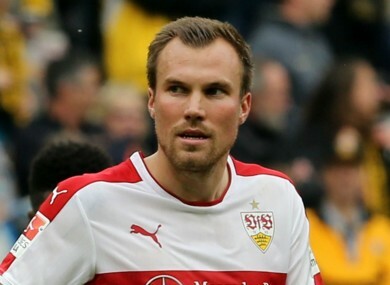 WORLD CUP WINNER Kevin Grosskreutz has left Stuttgart by mutual consent following a city-centre altercation that left him hospitalised. Wide man Grosskreutz — part of Germany’s victorious squad in Brazil in 2014 — was admitted to hospital with a laceration to his head following an incident in the early hours of Tuesday morning. The 28-year-old has since been discharged but will not play for 2. Bundesliga outfit Stuttgart again after both parties agreed to go their separate ways. “I made a mistake, which I am very sorry about,” he said in a statement. ”I accept the consequences and regret that my time at VfB is over. Sporting director Jan Schindelmeiser commented that Grosskreutz had “screwed up big”, while head coach Hannes Wolf conceded the club were left with little option but to allow him to leave. After what happened, the termination of the co-operation with Kevin was the only logical step,” he said. Email “World Cup-winning star leaves Stuttgart after city centre fight”. Feedback on “World Cup-winning star leaves Stuttgart after city centre fight”.